On the next day after his company's IPO, Facebook founder Mark Zuckerberg swapped his trademark hoodie for a suit and married his college sweetheart Priscilla Chan. Appropriately, he chose to announce his nuptials by updating his facebook status to "married". According to various news sources, the wedding was a secret. The guests thought they were there to celebrate the graduation of Priscilla from her degree in paediatrics. It was a private event which was held in the backyard of his home at Palo Alto California. The guests numbered fewer than 100. The catering, which was from his favourite local restaurant, reportedly costing less than 10 dollars per head. 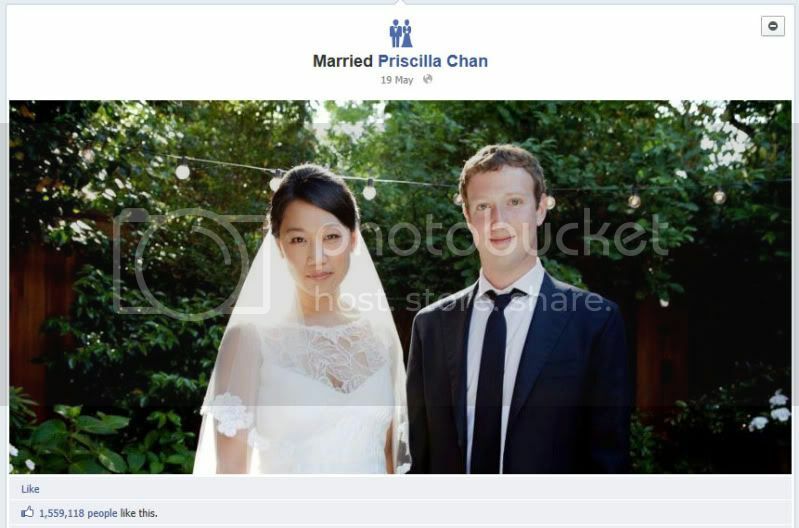 Zuckerberg, 28, and Chan, 27, spent four months planning the wedding, but had not publicly revealed they were engaged. Despite his strong advocacy of online openness and sharing, Mr Zuckerberg has long been secretive about his own personal life. Of all the happenings, what interests me is the wedding photo he chose to show to the world - a simple photo of the couple holding hands, looking at the camera smiling, with a warm glow of the sun in a backyard setting. Being a multi-billionaire, I'm sure he is able to afford the world's best photographer (whoever he or she might be) to create elaborate pieces for him. He could have go to Sweden and shoot in the Northern Lights. He could have chose a photo of him kissing or hugging Priscilla and show the world how much he loves her, but he did not. All in all, it wasn't his style. From the way the whole event was played out, he feels like a down-to-earth guy to me, and doesn't actively seek attention. Naturally, this photo he chose to post on his facebook account truly reflects his personality. On the other hand, there is also nothing wrong being a loud and extroverted person. If Aurora Borealis is your thing, go for it! If you like diving, put on your scuba gear and have an underwater photoshoot! Sky-diving and exchanging vows free-falling at 14000ft is perfect for the adrenalin junkies. What I'm trying to convey is, be true to yourself. Here at Wedding Photographer Melbourne, I like to chat with the wedding couple and sense their personalities. Usually this occured during our intial meeting. The topic of our conversation could range from hobbies, what they normally do on a Saturday night, and how they first met etc. By doing so, not only I could plan the look of the photos to compliment the clients, it would also help me to anticipate the bride and groom's next action during a wedding, and be on the standby to capture any spontaneous moments. I might very well end up with a simple photo which will not win any big awards, but if the clients are happy and gave me a personal award (mmmm...cookies), that would be the biggest motivation for me.